Seller: regentantiquesuk (2,779) 100%, Location: London N4 1BX, Ships to: Worldwide, Item: 371497922738 OUR LONDON SHOWROOMS OPEN MON to FRI 10am - 5pm And Alternate Saturdays Regent Antiques has been trading in London for three decades. We specialise in English and Continental antique furniture, silver and porcelain. Our main markets are Europe and North America and we export worldwide. 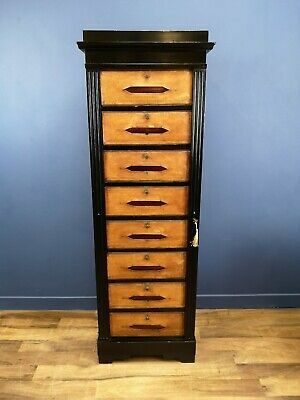 Antique Edwardian Wellington Chest by J Shoolbred c.1900 This is a fabulous antique Edwardian mahogany & satinwood Wellington chest, circa 1900 in date. The chest was made by the famous cabinet maker Jas Shoolbred & Co and the top drawer is stamped with his name. 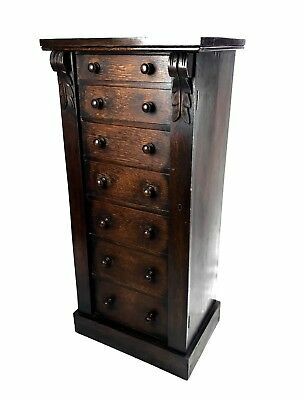 The chest stands on a plinth base and has seven graduating drawers each beautifully inlaid with floral motifs. It has an ingenious locking flap which means that you can lock all the drawers with one key. 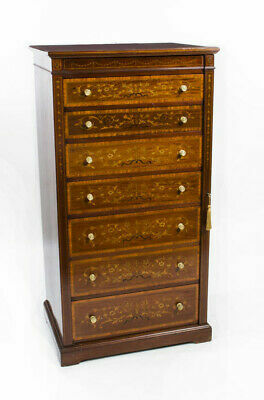 The drawers are very spacious, provide loads of storage, and have their original brass handles. It is a spectacular piece which would look amazing in any room. Condition: In excellent condition, please see photos for confirmation. Dimensions in cm: Height 120 x Width 63 x Depth 46Dimensions in inches: Height 47.2 x Width 24.8 x Depth 18.1 James Shoolbred started his company in Tottenham Court Road by purchasing number 155 in the 1820s. He was involved in supplying textiles to the burgeoning interior decoration market in London. He must have done well and quickly because he soon purchased numbers 154 and 156, either side of the original building. With his newly expanded premises, the shop was restructured and the stock was expanded. The new premises included a haberdashers and a carpet warehouse, as well as expanded accommodation for the stock of textiles, which included wool, silk and linen. By the 1880s the company had expanded to such an extent that the business had to move again, this time into premises that functioned as an early department store. The new store was popular from the start. One aspect that proved popular with customers was the detailed displays of interior decorative schemes. Furniture, textiles, carpets and various accessories would be laid out as they would be seen in a real interior. This made it much easier for customers to perceive what their purchases would look like outside the constraints of the department store. It was also a good retail trick as it encouraged customers to buy whole ensembles, which they could reconstruct in their own home without having to hire an interior designer or sort out interior schemes themselves. This marketing trick is still used extensively today by such retail giants as Ikea. By the 1870s, the company had started to design and manufacture their own furniture. This furniture, along with other interior accessories, were displayed in a series of catalogues that started to appear from about 1873 onwards. The catalogues were meant to expand the appeal of James Shoolbred & Co beyond their department store, and more importantly, beyond London. Furniture design became an increasingly important aspect of the company and therefore played a large part in the catalogues that the company produced every year. All the major fashionable Revival movements were included, ranging from Gothic to Japanese, and included the numerous French styles. Interestingly, because James Shoolbred & Co produced catalogues that were so detailed and wide ranging, many were used as literal pattern books in order to copy the latest London styles. This was a particular problem in far-flung British outposts like Australia and New Zealand where there was a brisk trade in James Shoolbred & Co furniture design, with details being worked out from the illustrations generously provided by the company. This furniture was then passed off as being part of a locally designed production. The catalogues today are an intriguing view of interior tastes and styles of the later nineteenth century and are an invaluable tool, as are all catalogues, for any researcher, historian or anyone with an interest in the history of domestic interior design and decoration. Despite James Shoolbred & Co’s popularity and market presence, the company struggled after the market crash of 1929 and closed for good in 1931. Mahogany is probably one of the largest ‘families’ of hardwood, having many different varieties within its own species. Mahogany has been used for centuries in ship building, house building, furniture making etc and is the core structure of just about every 19th century vanity box, dressing case or jewellery box. It became more of a Victorian trend to dress Mahogany with these decorative veneers, such as Rosewood, Kingwood, Burr Walnut and Coromandel, so that the actual Mahogany was almost hidden from view. Mahogany itself is a rich reddish brown wood that can range from being plain in appearance to something that is so vibrant, figured and almost three dimensional in effect. Although Mahogany was most often used in its solid form, it also provided some beautifully figured varieties of veneer like ‘Flame’ Mahogany and ‘Fiddleback’ Mahogany (named after its preferred use in the manufacture of fine musical instruments). Cuban Mahogany was so sought after, that by the late 1850′s, this particular variety became all but extinct. Satinwood is a hard and durable wood with a satinlike sheen, much used in cabinetmaking, especially in marquetry. It comes from two tropical trees of the family Rutaceae (rue family). East Indian or Ceylon satinwood is the yellowish or dark-brown heartwood of Chloroxylon swietenia. The lustrous, fine-grained, usually figured wood is used for furniture, cabinetwork, veneers, and backs of brushes. West Indian satinwood, sometimes called yellow wood, is considered superior. It is the golden yellow, lustrous, even-grained wood found in the Florida Keys and the West Indies. It has long been valued for furniture. It is also used for musical instruments, veneers, and other purposes. Satinwood is classified in the division Magnoliophyta, class Magnoliopsida, order Sapindales, family Rutaceae. Wellington Chest is one of the most famous pieces of campaign furniture, which was named after the 1st Duke of Wellington. The campaign furniture were made for travel so they had to be very compact and practical. They are recogniseable because they had to be easy to dismantle and fold. This type of chest was first seen in the 1820s and is characterised by their tall narrow shape, and usually with a locking flap on one side, which when closed, prevents any of the drawers from opening. They continued to be made in the Victorian period in mahogany, walnut and rosewood. 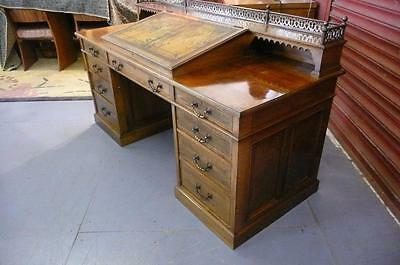 Some had a fitted secretaire occupying two drawer heights, but these are not considered as desirable as the all-drawer model. Due to their compact size, Wellington chests are keenly sought and command high prices. Watch for secretaire versions that have been converted back to full-drawer models, the give-away being the new drawer linings in two of the drawers. Our reference: 06423 Image gallery Take a tour of our London showrooms Write to us: Regent Antiques Manor Warehouse 318 Green Lanes London N4 1BX By Underground: Take Piccadilly line to Manor House station. Go to top of escalators and turn left. Take exit 7 and walk straight on for 10 metres. Manor Warehouse is on the right. By road: There is car parking available on site. Payment Pay with your credit card through PayPal. 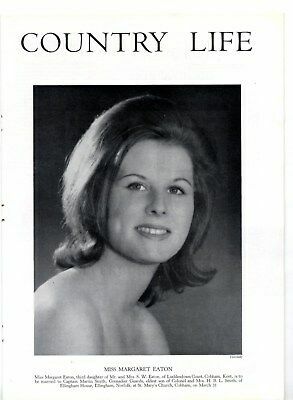 Please make all cheques payable to "Regent Antiques." Bank details: Regent Antiques - BBVA - Account: 05701615 - Sort: 23-59-11 Shipping and returns We ship worldwide. Postage and packing for: Mainland UK: £75.00 European Union: Postage and packing charges upon request North America: Postage and packing charges upon request (Please note that this is in Pounds Sterling, not US Dollars) Rest of world: Postage and packing charges upon request If you require shipping to a location for which a shipping charge is not provided, please ask for a quote prior to bidding. Williams and Hill Forwarding is our preferred shipping agent for our valuable and fragile furniture items delivered within the UK. After you purchase, we will make all the arrangements to get your item to your door. Stephen Morris Shipping is our preferred specialist for delivery outside of the UK. Increased shipping costs incurred when purchasing additional items are generally quite low. For the best value, we recommend offsetting this cost by purchasing multiple items. We require that someone be home on the agreed delivery day if applicable, otherwise a redelivery fee will apply. In accordance with Distance Selling Regulations, we offer a 30-day money back guarantee if you are not satisfied with the item. The item must be returned in its original packaging and condition. Unless the item is not as described in a material way, the buyer is responsible for return shipping expenses. Buyers are fully responsible for any customs duties or local taxes that may be incurred on items sent outside of the European Union. Popularity - 2,778 views, 2.2 views per day, 1,243 days on eBay. Super high amount of views. 0 sold, 1 available. 2,778 views, 2.2 views per day, 1,243 days on eBay. Super high amount of views. 0 sold, 1 available.